There can be many benefits to taking an active holiday, which are often a great way to experience travel to a new place or to rediscover places you’ve visited in the past. There are many options that suit all levels of interest and experience available across the UK. Whether you want to get in long rides or have a leisurely exploration of the countryside and villages, there is likely a cycling holiday that will be of interest to you. Cycling has become a huge tourism and travel industry, and there are many cycling holidays available to purchase across the UK. There are options available for all skill and interest levels, and can be purchased as a guided tour or you can plan vacations that include well-known cycle touring areas and explore yourself. Depending on your level of riding, you can expect to get a good amount of miles in on your bicycle and likely learn a few things along the way. Cycling tours range in difficulty from easy or beginner to moderate and challenging. There are options for joining group touring vacations or securing a privately guided tour for your small group. The advantages of booking a private guided tour include being able to travel at your pace and explore exactly the type of terrain you want, while joining group tours have the potential to connect you with other like-minded cycle and travel enthusiasts. When taking a guided tour on a cycling holiday you can expect to enjoy leisurely paces while exploring local points of interest and enjoying meals, snacks, or a beverage at local establishments. Often you are able to enjoy these experiences and not feel hurried along, yet the additional activity and exercise help contribute to the enjoyment and memorability of the experience. The relaxing pace and comfortable experience will help you to enjoy the holiday away from the stress of life, while still remaining active and adventurous. Many cycling holidays and tours may include aspects that can improve the experience of travel and incorporate other interests you may have. If you enjoy wine tasting, or trying the brew at a local coffeehouse or alehouse, there is likely a cycling holiday you can book to combine the joys of riding and travelling to have new experiences. There are even cycling holidays designed to incorporate the experience of nature and wild-life, such as rides along the coast or through wildlife preserves. Cycling is often one of the greatest ways to enjoy the countryside or explore new towns and villages, and there are many cycling holidays available that will suit your interests. Many well-known travel destinations are also becoming famous for their access to local mountain biking trails if you are interested in exploring off-road. If you are already an avid mountain biker you may be able to explore the trails on your own, but you can also hire local guides to show you the ropes. If you haven’t tried mountain biking and are already an avid cyclist, you may be interested in taking a holiday dedicated to trying something new. 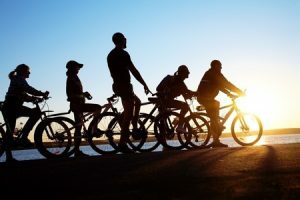 With the growing popularity of this sport, there are many cycling holidays dedicated to mountain biking and exploring the many trails that are being developed. If you plan to do some cycling on your own while on holiday, you should review the available information or reach out within any club or cycling network to plan the best routes and destinations. Whether you are using published materials and tour guides, or the advice of trusted friends and acquaintances you can explore and enjoy a self-guided and self-motivated cycling holiday. If you want a combination of guided cycling tours with some freedom to explore on your own, you can purchase single day guided tours to accompany your own explorations. Taking an active holiday can be a great way to create new memories with friends and loved ones, whether enjoyed as a couple or in small groups. Various cycling holidays are also designed to cater to business company retreats or outings to help strengthen the bonds between co-workers. The adventure and shared experience serve to help generate shared memories and points of conversation that can last for many years. The breathtaking views, the exploration of new and interesting places, and the sense of comradely while cycling on holiday create the perfect balance for an enjoyable way to have shared experiences. In the UK its important to follow Rules for cyclists (59 to 82) because it could save your life. With the popularity and variety of cycling holidays available across the UK, you can explore the many options and determine which might best suit your plans. Even cycling isn’t one of your biggest passions, taking a cycling holiday can be a great way to seek some adventure and travel through new places. Regardless of your cycling ability, your desire to ride shorter or longer distances, or the other interests you would want to pursue while on a cycling holiday, there is certainly a cycling holiday for you to enjoy. This entry was posted in News on July 13, 2016 by admin. The activity of cycling provides a variety of health benefits, including the potential to build muscle, strengthen your core, and improve your cardiovascular capacity. Beyond the benefits to your overall health and fitness provided through regular cycling, such consistent exercise can also serve to reduce your overall levels of stress. 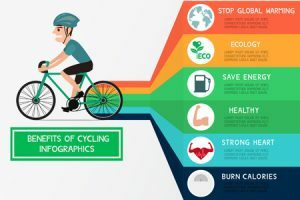 The many health benefits to regular cycling are also long-term and improve exponentially as you continue riding over the course of many years. The importance of getting regular activity cannot be understated, and doing something that you enjoy can help to keep you active consistently. A regular workout, such as cycling, helps to maintain your cardiovascular health and lung capacity. The all-muscle engagement of cycling keeps your muscles lean and toned, which improves your balance and reflexes. As mentioned, the regular activity helps keep your stress managed and your body in a less tense state. As the many direct benefits to your body begin to accumulate you will notice improvements in your overall mood and general state on a daily basis. You can drastically vary the rigorousness with which you exercise, within a single riding session or on different outings. Typically, you will want to set a pace you can manage for extended cycling if you are going for long distances and increase the pace over short distances. You can also pedal rapidly over very short distances, or sprints, and cool down for a period between each sprint. This type of variation will ensure you are getting a full body workout and are maintain a high level of overall health. One of the greatest aspects of getting and staying healthy through cycling is that the sport itself offers a broad range in levels of difficulty. If you are new to cycling, or are just beginning your journey towards improved health and fitness, a ride simple ride along an established pathway without significant changes in altitude will suffice for most beginners. You can increase the level of activity simply by extending the distances you ride, or seeking inclined terrain that includes changes in altitude. Cycling twice during the week and taking one longer ride on the weekend will help keep your entire body healthy and in shape. You will quickly notice your capacity to handle longer and more difficult rides, as your fitness and health improve. For the most part, getting exercise through cycling is considered to be low-impact on your body. The benefits of developing a workout routine that is low-impact means that there is less chance for strain or injuries than other forms of exercise. If you are in the process of advanced physical therapy from an old injury or issue, then cycling might be an appropriate next step to continue improving upon the physical therapy process. Because cycling is low impact, and the level of activity can be varied, it can be done through different periods of life and keep you healthy as you age. Despite the fact that cycling is a low impact sport, it can still serve to strengthen bones and improve joint mobility. Maintaining a high level of activity can help combat the symptoms or issues that arise from conditions such as arthritis or osteoporosis. While cycling is not a treatment for these issues, it can help improve your body’s capacity to address and manage such issues. The combination of a full body, low-impact workout that can be done over long periods of time make cycling one of the best options for exercise. New studies also suggest that regular exercise, such as cycling, can help improve your overall brain function. Various chemical and neurotransmitters are released during vigorous activity, which can have positive and lasting effects on your brain chemistry. Increased cardiovascular activity occurs while cycling, and the increased blood flow can be beneficial to the brain. The old adage of “use it or lose it” holds some truth, and a regular cycling routine can help improve the function of your brain while working out the rest of your body. One of the greatest and most serious diseases facing society can be the results of lifestyle, including obesity and adult onset diabetes. If you are looking to improve your health, or maintain your already good health, then cycling can be one of the greatest ways to achieve that goal. Cycling lends itself well to building a more rigorous workout over time, this way you are not attempting to over exert yourself and can increase the difficulty of your workout. The health benefits obtained from regular cycling can help to prevent serious diseases such as obesity, stroke, heart attack, diabetes, arthritis, and depression. As with any new endeavour where physical activity is involved, you will want to check with your health care provider to ensure you are healthy enough to engage in such exercises.